Thank you for following Ahram Online's live coverage of the first day of voting in Egypt's constitution referendum. Our wrap-up of the day's main events will be published soon. Voting will resume at 9am tomorrow. Goodnight! 21:25 Polling stations are now closed, Medhat Idris of the Supreme Electoral Committee has announced. Ballot boxes will remain at polling stations overnight after being sealed, he adds. 21:05 Speaking to Ahram Online’s Lamia Hassan at Abu Bakr Al-Siddiq polling station in Dokki, Niveen Mofeed El-Ebiary, programmes manager at the American University in Cairo, says she’s optimistic that the majority of Egyptians will vote in favour of the constitution. The voting process was very slow at the beginning of the day, she adds, due to a shortage of judges, but went smoothly after complaints were filed. 20:55 Hosni Mubarak is yet to vote in the referendum, according to his lawyer, Farid El-Deeb. The former president has twice requested permission to vote at the military hospital in Maadi where he is based, because he is too sick to vote at a polling station, El-Deeb told Al-Ahram Arabic news website. 20:25 Upper Egypt’s Sohag, where four people were killed earlier today, is now calm, Ibrahim Saber, head of the local security directorate, tells the privately owned ONTV channel. Earlier today, Morsi supporters fired at civilians and police from rooftops in the city, Ibrahim says. Several police personnel were injured in the clashes. 20:00 Ahram Online’s Bassem Abo Alabass sees five people turned away from polling stations in Giza's Haram district after learning they have been registered abroad. 19:55 The death toll in clashes across Egypt has risen to ten. A man was shot dead in Giza’s Osim district during clashes between security forces and pro-Morsi protesters, Al-Ahram Arabic news website reports. The clashes broke out after the dead man, along with other Brotherhood loyalists, fired at police while trying to prevent voters from participating in the referendum. 19:50 Thirty Brotherhood members have been arrested in Alexandria, Al-Ahram Arabic news website reports. They were allegedly in possession of Molotov cocktails and were trying to disrupt the voting process, according to a security directorate statement. 19:45 A small explosion has taken place at a polling station in Cairo's Al-Mahala Al-Kobra district. An unknown assailant threw a primitive homemade bomb from the roof of a building next to the Al-Horeya polling station, security sources tell Al-Ahram Arabic news website. The explosion caused a loud bang, but there were no casualties. The police sent reinforcements and scanned the area for more bombs. 19:35 Ahmed Fawzy of the leftist-liberal Egyptian Social Democratic Party (SDP) attributes the high first-day turnout to the public's wrath against the Muslim Brotherhood. "I think the people are voting only to punish the Muslim Brotherhood for their violence and for continually standing against the transitional roadmap," Fawzy tells Ahram Online. "The Brotherhood is definitely the dumbest political organisation in history. Every day that passes, they become less popular and they lose more ground. The national charter will be endorsed no matter what they do today or on the second day [of voting]." The day’s voting saw clashes between supporters of ousted president Mohamed Morsi, who hails from the Brotherhood, and those in favour of the constitution and the interim government’s political roadmap, leaving at least nine dead so far. Pro-Morsi protests have been rife since his overthrow on 3 July. 19:30 One of the four people killed today in Sohag was a 14-year-old boy, a source at the forensic science authority tells Ahram Online. 19:20 Voting is continuing in a peaceful manner at most of the 13,000 polling stations across the country, according to Al-Ahram's journalists in the field. There are sporadic protests outside some polling stations by Brotherhood supporters calling for a boycott. Violent clashes have also been reported in a number of areas. He also called for the date of presidential and parliamentary elections to be set as soon as possible after the results of the referendum are announced. “I will abide by the decision of the Salafist Call and Nour Party regarding their choice of a presidential candidate,” added El-Borhami. 18:45 A third pro-Morsi protester has died in clashes with security forces in Giza’s Nahyia district - bringing the death toll across Egypt to nine, Al-Ahram Arabic news website reports. 18:15 Another death from clashes between security forces and the Muslim Brotherhood, this time in the Al-Kanisa district, near Giza governorate in west Cairo, brings today’s death toll to eight, Al-Ahram’s Arabic news website reports. Brotherhood supporters reportedly fired shots at voters until security forces took control of the situation. 18:10 Sherif Taher of the liberal Wafd Party says the percentage of voters endorsing the constitution is not the crucial thing -- a big turnout is of the utmost importance to give the charter undisputed legitimacy. "There is no doubt the 'yes' vote will exceed 90 percent, this is no concern, given that the Muslim Brotherhood has decided to boycott the poll," he tells Ahram Online. "What really matters now is that we see a high turnout." "I am afraid the media keeps saying the numbers are huge, which could make other people not bother to cast their ballots. They should start urging people to go, it doesn't matter what their votes are, but they have to go." "If, for instance, the turnout does not exceed 30 percent, that would mean the public has more or less rejected the constitution. But on the contrary, if the turnout is 60 or 70 percent, that will strengthen the status of the constitution." 18:00 The Ministry of Health announces three voters have died of natural causes on Tuesday, according to Al-Ahram’s Arabic news website. A medical source confirmed earlier to Ahram Online that the death toll for those killed in clashes had reached seven. 18:00 Battling a strong flu that has kept him bedridden for two days, Al-Azhar's Grand Imam Ahmed El-Tayeb has voted in his hometown in the Upper Egyptian governorate of Luxor. 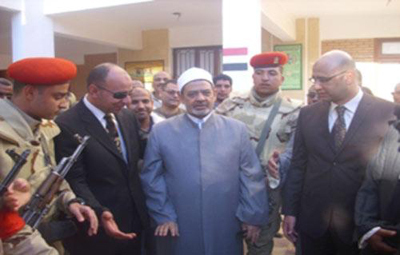 El-Tayeb cast his ballot at Al-Awameya Elementary School in West Luxor, amid tight security. 17:55 The Supreme Electoral Committee (SEC) issues a second statement stressing that no judge has been removed from his polling station, as claimed by several media outlets. The statement also denies claims that the voting process will be extended to Thursday, affirming that voting will be on Tuesday and Wednesday only, as announced by interim President Adly Mansour. 17:50 Fifteen Brotherhood members have been arrested in the Nile Delta’s Sharqiya governorate for allegedly campaigning against the constitution, state news agency MENA reports. They will be detained for 15 days pending investigation into charges of inciting a boycott of the national charter and practising violence. 17:40 Army spokesman Ahmed Ali says Egyptians, “the first free people in the history of humankind,” have continued to surprise the world by working to build a modern future. Speaking on radio channel 9090, Ali says the voting process is going smoothly and safely "despite some disruptive attempts by the terrorist organisation [the Muslim Brotherhood]." He confirms voting is now going smoothly in these areas, and the police and army are using “self-restraint” but can employ strength and decisiveness if the situation calls for it. “Desperate attempts” to stop Egypt's progress will fail: although Egyptians might worry about their country, they will never be scared by anyone except God, Ali adds. He praises Egypt’s women and youth who, according to him, are leading the polling lines. 17:25 The Supreme Electoral Committee releases a statement saying that it has not excluded any judges from overseeing the elections. “A number of judges were replaced because they were too exhausted and were not able to continue till the end of the day,” the statement says. The judges club announced earlier that it had received a number of complaints regarding judges directing voters to vote "no" on the constitution. 17:20 Police and soldiers have ended clashes on Geish Street in the canal city of Suez between pro-Brotherhood and pro-constitution protesters. Violence broke out after Brotherhood supporters raised flags and posters bearing the four-fingered Rabaa sign, a symbol of the Islamist movement against the post-Morsi government, before their opponents snatched them away and burned them. Riot forces fired teargas to disperse the fighting crowds. 17:15 A police officer has been removed from a polling station in Cairo’s northern Ain Shams district after he reportedly fought with the station’s judge, Rabab Mohamed. 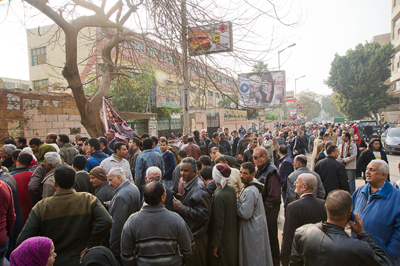 According to Ahram Online’s reporter at the scene, the dispute started when the officer complained that the voting process was going slowly, which judge Mohamed saw as an interference in her job. 17:10 Hosni Mubarak's lawyer Fareed El-Deeb tells Reuters that the former leader, currently facing trial for his role in the killing of protesters in the 2011 uprising that toppled him, intends to vote. “He wants to vote … of course it will be a 'yes' for the constitution,” El-Deeb says. 17:05 A source from the judges club operation room tells Ahram Online’s El-Sayed Gamal El-Deen that the head of a polling station in Heliopolis’ Al-Nozha district, east Cairo, has been replaced after he was caught asking residents to vote against the referendum. 17:05 The Salafist Nour Party says its former MP, Wagdi El-Seify, was assaulted by Brotherhood youth, who also “destroyed” his car, while they were marching in El-Shobak village in Giza on Tuesday afternoon. The party’s election observers reported the incident to the police. It is yet to be confirmed whether El-Seify was injured in the attack. Mostafa adds that “what's not carved in stone can be amended." Most people Mostafa knows will be voting “yes” and although she is optimistic about the future, she says she will be “very disappointed if El-Sisi runs [for president]." 16:50 Presidential spokesman Ahmed El-Muslimany says this morning’s bomb blast in Imbaba has not affected voter turnout. 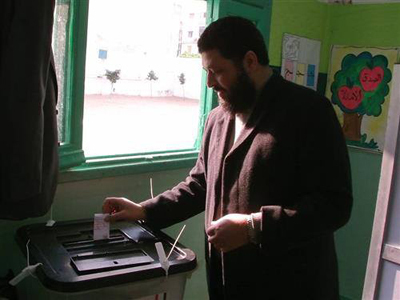 “The Egyptian state is not scared or trembling from these terrorist attacks,” Al-Muslimany tells reporters while voting at Al-Qawmia Al-Moshtareka school in Zamalek. He calls on Egyptians, regardless of their stance, to participate in the referendum. The new constitution, if approved, will replace the Islamist-drafted 2012 charter. According to the post-June 30 political roadmap, a successful referendum will be followed by parliamentary and presidential elections within the next six months. However, Al-Muslimany says interim President Adly Mansour has not yet decided whether presidential or parliamentary elections will take place first. 16:40 Yasser El-Borhami, spokesman for the Salafist Call group and godfather of its political wing, the Nour Party, calls on Egyptians to vote “yes” in the referendum “in order to bring stability and start building state institutions,” state news agency MENA reports. “I expect high participation and approval of the new charter,” El-Borhami says. 16:35 An Ahram Online reporter says queues are growing at polling stations in Giza's Muhandiseen district, mostly due to people voting after finishing work. Most say they will vote "yes." 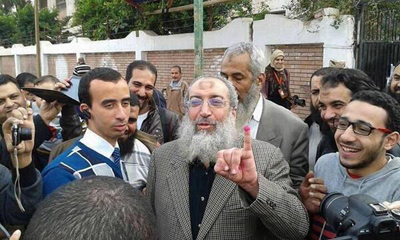 16:30 Nour Party releases picture of its deputy leader, Talaat Marzouq, casting his vote. The ultra-conservative Islamist party, which formed the second-largest bloc in the 2012 parliament after the Brotherhood, turned against Morsi months before his ouster, arguing that he and his organisation were responsible for the Islamist current’s declining popularity. Nour backed the 3 July roadmap and campaigned for the new constitution despite its reservations on changes made to Sharia-related articles. 16:20 Queues are growing at polling stations in Upper Egypt’s Assiut as people finish work. The security presence remains high. 16:15 A third polling station has opened in the Red Sea city of Hurghada to accommodate voters who are registered in other governorates. Many of the residents of Hurghada are temporary workers in the tourism sector. 16:00 A medical source tells Ahram Online that today’s death toll has risen to seven. Four have been killed in Upper Egypt’s Sohag, two in Giza’s Nahiya district and one in Beni Suef. Only five of the deaths have been officially confirmed. 15:55 The Brotherhood-led National Alliance to Support Legitimacy (NASL) releases a statement claiming four of its members have been killed by police and that several have been arrested, including three female minors. The alliance further claims a low-turnout, accusing the ‘coup-led media’ of falsely claiming the opposite. It also accuses remnants of the Mubarak regime of forging votes and bribing voters to approve the newly-amended national charter. NASL, the largest Islamist coalition, has boycotted and protested against the referendum, part of a wider resistance against the post-Morsi interim government, which it has deemed illegitimate. 15:50 Ahram Online's Sarah Rashidi notes that the Fanoon Gamila polling station in the Cairo district of Zamalek is not as crowded as it was in the morning. Amira Mohamed, who works in the real estate business, told Rashidi: "I'm voting 'yes'. I'm not 100 percent happy, but maybe this is the only way. We need the country to be stable, we just want stability in our lives." 15:50 A poll conducted in December by private polling organisation Baseera found that 59% of respondents had not read the new charter, while 36 percent had read "parts" of it. 76% of respondents said they would take part in the referendum and 74% of those said they would vote yes. 15:35 Judicial source tells Ahram Online`s Bassem Abo Alabass that the highest turnout so far is in El-Talbeya in Giza’s Haram district, particularly at a school named Om El-Abtal, which translates as ‘The Mother of Patriots’. Welcome to the second half of Ahram Online's live coverage of the first day of voting in Egypt's 2014 constitutional referendum. The day began with an explosion in Giza's Imbaba district, but there were no reported injuries. There have been a number of pro-Muslim Brotherhood protests across the country with five deaths reported so far. Turnout looks to be high so far, with lots of long queues reported at polling stations. This constitution is the first electoral test in the roadmap put in place by the transitional authorities that replaced Mohamed Morsi afer his ouster in July 2013. Over 52,742,139 Egyptians are registered to vote at the polls, which will be open on Tuesday and Wednesday. 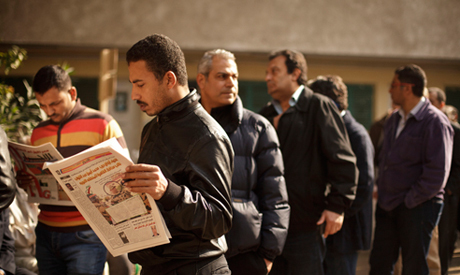 Egyptians living abroad have already cast their votes at embassies and consulates. Turnout was low, which the foreign ministry attributed to the scrapping of postal votes. The last time Egyptians went to the polls was in December 2012 -- to vote on a new constitution, written by an assembly that critics said was dominated by Islamists. That constitution was approved by voters, and remained in place until Morsi's ouster in July 2013, when it was suspended. The new document was drafted in the months following Morsi's exit, and finalised in December. For analysis of the differences between the previous charter and the one which Egyptians will be voting on this time round, see here. It seems likely that the "yes" vote will be substantial; unlike last year, the "no" campaign has been almost invisible. Most liberal and leftist parties support the constitution. The Strong Egypt Party, which supported Morsi's ouster but has since criticised the transitional authorities, has condemned what it described as a "crackdown" on those campaigning for a "no" vote, and decided to boycott the poll in protest.Other groups opposed to the constitution include the National Alliance to Support Legitimacy, a Muslim Brotherhood-led coalition, which will be boycotting the vote. Polls are due to close at 9pm. As it is normal to rant at popular votes and badmouth governmental activities it sure is not normal to try to keep fellow co-citizens from voting by random shooting - as is the case in Delga - or even put bombs and Molotov- cocktails or burn tires!! Only talking with the people and judging the referendum by the light air and happiness that could be found again in the streets of Egypt would've lead to assume, Egypt has a good future again SOON! Considering that the people have to defend themselves against an obstinate minority which shows no intention to participate in the construction of a democratic state of Egypt and that their threats to violently hindering the referendum to be carried out so it had to be secured with heavy security measures.. I'was surprised so many people already went to participate! Egyptians are a very special people.- Thank's for the coverage! Good Luck to Egypt! So they are going to restrict freedoms and liberties and increase Military control. Nearly 900 Egyptians were killed by Mubarak in less than 3 weeks and now he is free and going to vote on this referendum lol? Also even the liberal activists that sparked the first revolution are now in jail and ElBaradei had to flee the country for CRITICIZING the military killing hundreds of men,women and children protesters. I guess some people are simply not ready for democracy, maybe in a hundred years or so. I will abide by the decision of the Salafist Call and Nour Party regarding their choice of a presidential candidate,” added El-Borhami...... DO THEY REALLY THINK EGYPT WILL VOTE IN ANOTHER ISLAMIST??? LOL!! !